Patented Perfect Bark™ technology ensures your dog’s bark is the only sound that will cause the correction. 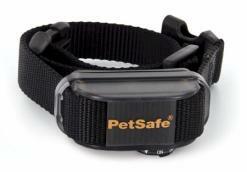 Before playing with your dog, remove the anti-bark collar. The activity may cause your dog to bark, which could lead to him associating the play with the Static Correction. Never leave the Anti-Bark Collar on your dog for more than 12 consecutive hours.